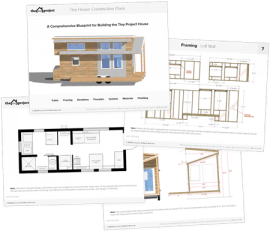 If you are a person who loves doing internet research, picking up new skills, asking for help, planning and preparing for all that you do, then it’s very conceivable that you could create your own set of tiny house plans for your build. But many people don’t have the time, patience or simply the personality type that would allow them to do all that work themselves. 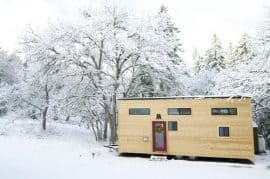 For this reason, a good set of plans is one of the best ways you could SAVE a lot of money (and maybe more importantly, sanity) on your tiny house build. But why is this and how much should you spend for this benefit? The designers and builders of many of the most popular tiny houses out there spent literally hundreds — if not thousands — of hours doing months or years of online and in-person research, planning, materials sourcing, measuring, testing, altering, designing custom furniture, rejigging of all types as they learned more about what works in tiny house design and what doesn’t. They no doubt had to create countless design revisions to come up with the final design plans for what they built — and what they ultimately sell to you as tiny house plans. Not only that, but how do they know it’s going to work — to stay together under hurricane force winds traveling down the highway or under heavy winter slow loads in the Rockies? Designing a set of tiny house plans also takes architectural or engineering knowledge. At the very least it takes a friend to double check each part of the plans for structural integrity or the hiring of a third party to perform a structural review. That knowledge and experience doesn’t come for free. But wait. how do those that have created these plans know what construction practices will work and what building materials are better than the other for use on tiny houses? They usually know from personal experience or through very careful, dedicated research. They know the relative weight of materials and how to build lighter to make a house easier to tow. They know the right fasteners to use to build safely following building codes and the latest, high-efficiency standards. They know how to frame a house to withstand bumpy roads and windy weather and what materials to use for a house to properly shed water, to breathe and ventilate, to stay warm in winter and cool in summer. 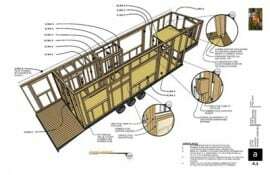 They know little details like what hinges to get for an outswing door, how far you can build out over your trailer tongue before you sacrifice turning radius, and how to properly bolt wall and subfloor framing to your trailer. All of this knowledge and experience goes into the plans they sell. OK, so all that sounds like a lot of work, but what is it worth? If you were to break it down hours spent, even at minimum wage, you’d probably have to spend a couple thousand dollars for all that work and experience. And architects and engineers (or even carpenters) do not work for anywhere near minimum wage! Or think about how much YOUR time is worth for you. If something saves you 10 hours of your own time, what is that worth to you? What if it saves you 100 hours of research and planning, or 500 hours? Even if you value your time as low as possible (again, minimum wage), that figure adds up pretty quickly, doesn’t it? How much does a few semesters of evening courses at a community college cost, plus an internship with a carpenter, plus gas money to and from all those classes? Any way you break it down, the amount of time and money you save from buying high quality tiny house plans is immense. When you buy plans from someone you know and trust, you get hundreds or thousands of hours of combined knowledge and experience in one small package, usually priced at just a couple hundred dollars. To me, that sounds like the deal of a century! OK, so let’s talk numbers. What do some of the best tiny house plans out there cost? Here are some for your consideration. My plans, for the award-award winning Tiny Project house, are priced at $250 or lower. Wait for a seasonal sale or sign up for my mailing list and you’ll get coupon code for huge discount — so you can usually get them much cheaper. The plans for Vina’s tiny house, or Sol Haus, are a bit more expensive at $385, but the design of the house is iconic in its simple beauty and definitely one of the best out there in the 20′ size. These plans have also been reviewed and found to be excellent. Portland Alternative Dwellings and Shelterwise offer some very well executed and competitively priced plans, usually available for $99-$199. The Cider Box and Hikari Box are great designs worth checking out and are available in multiple sizes from 20 -24′. 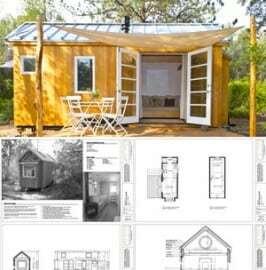 The very well known hOme plans by Andrew and Gabrialla Morrison are available for $199-$299 and are widely considered to be the benchmark for tiny house design and knowledge. These plans are also part of the independent review and are highly recommended! 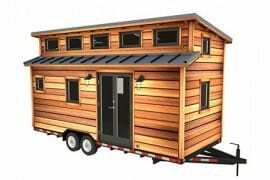 Macy Miller’s MiniMotives house plans (somewhat unique in that it uses a gooseneck trailer) are also always a crowd favorite and compare at $250-350. This is a great alternative for those not wanting a ladder to a loft bed. Macy’s plans are also very well reviewed and recommended. Everyone has a different style preference, desired size and needs, so no set of plans is better than the rest. Whichever you choose, know that the information and design experience you are getting is worth every penny and then some! Rest easy knowing you’ll save yourself many future headaches by starting from one of these great tiny house plans, even if you choose to alter it significantly to meet your needs. Click here for more details about all of the above plans. Check out TinyHousePlans.com – your 1-stop resource for the best time house plans for sale. 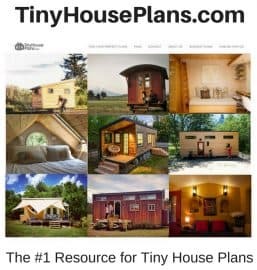 TinyHousePlans.com is a central site from which to browse for tried-and-true plans, making this search sometimes tedious and time consuming. Their curation process is intensive and only those tiny house plans which meet their strict safety and quality standards make the cut. We’re honored to be included, but more importantly we want to share this with you as we think it’s a really important resource that’s been needed for a long time. Click Here to check out all the plans.